I had not heard anything about a pending watchOS update but here is one anyway! 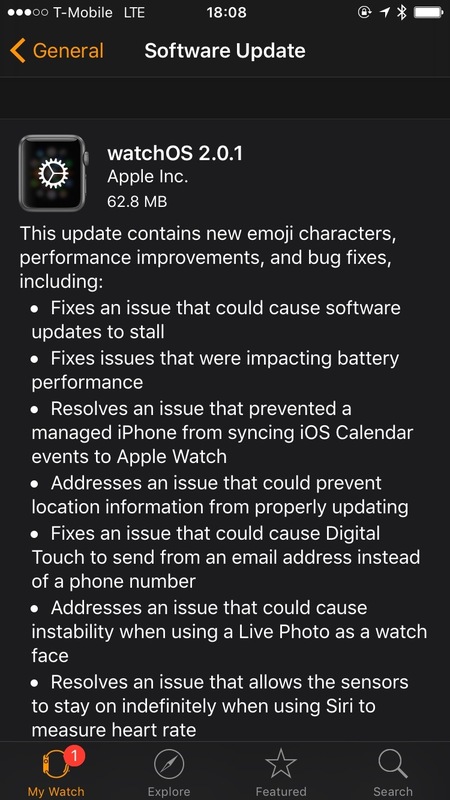 I notice it has some battery management improvements which I think I know someone picked up at watchOS 2.0 so that is good. Here is the list of improvements. I should mention that you need your watch and iPhone plugged in. Although they both had lots of juice and I started the update fine, part way through it was paused and it said to plug them in. I did, and in a moment or two it continued and all upgraded fine. Not sure yet what this will do to battery life but I hope it helps those who have this issue! BTW, here is full info on doing the update. Previous Post iOS 9.1 is here! Next Post OS X 10.11.1 is here!